The LED headlight of your G850GS or F750GS is awesome, but vulnerable and expensive to replace. Installation if the Touratech Headlight Guard can make all the difference. Let Iain show you how in this video. Iain here with Touratech USA, and this is the headlight guard, stainless steel mesh, for the BMW F850GS and F750GS. This is the headlight guard piece itself. Stainless steel, it’s coated black. These are the mounting brackets for the headlight guard. It’s got some M6 button head bolts, some M5 washers, some M5 button head bolts, a bunch of M6 washers, two long M6 button head bolts, four of the female quick release parts, four of the male quick release parts, and then four spacers for attaching the mounting pieces for the guard. To start the installation of the headlight guard on the F 850GS, I like to build the headlight guard shield piece first. You do that with four of the M6 button head bolts and all four of the male quick release components. You’ll want to use a washer on the bolt and as you’re screwing it in, you’ll notice that the bolt stops part ways into the male piece. That’s because there’s a pinched thread in here that’s a mechanical thread locking device. So make sure you have an 11 millimeter wrench handy while you’re using your 4 millimeter Allen Drive tool to really screw that thing all the way in. Next thing to do is prepare the mounting brackets using the four rubber female quick release parts. You just push these through with your thumb from the front side of the bracket. There are two bolts that you need to remove on either side of the headlight. The first requires a Torx T30 wrench that’s in the blinker stock. The one slightly below and forward of the blinker stock requires a Torx T25. When you’re taking out the blinker stock bolt, you’ll also need to grab a nut on the backside of the fairing with a 10 millimeter Spanner. Now we’re ready to install the mounting bracket on this side of the motorcycle. You have for black plastic spacers. Look closely at those spacers and you’ll see that some of them have a larger inner diameter hole. Use the larger hole on the M6 bolt. Use the smaller hole on the M5 bolt. Also, there are washers included in the kit. You’ll notice that they’re M6 and M5 washers. Make sure you get those on the corresponding bolts. This mounting bracket uses two different size bolts. You’ll see there’s an M6 and an M5 bolt. The M6 bolt goes in the blinker stock. The M5 bolt goes below and forward of the blinker stock. To install the nut on the backside of the blinker stock, it’s actually quite difficult to reach here, so I’ve used a piece of masking tape on the backside of a 10 millimeter wrench. And I placed the nut in here and kind of taped it in. This’ll hold the nut in place so I can reach into the fairing and tighten this bolt up. Now that the headlight guard brackets are installed on either side of the headlight, we’re going to install the shield and make sure that the fit is where we want it before we tighten down the bolts for the brackets. Now we just tighten up the screws on both sides, hand tight. Using a 3 millimeter Allen wrench on the M5 bolts and a 4 millimeter Allen wrench on the M6 bolts. And just like that, the headlight guard is installed on your F 850 GS. 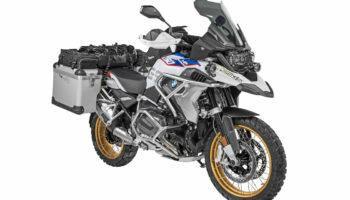 If you want to learn more about the products we offer for this bike, visit our website at Touratech-USA.com and visit us on social media. Let us know how the headlight guard looks on your bike and let us know it’s working when you go out riding.